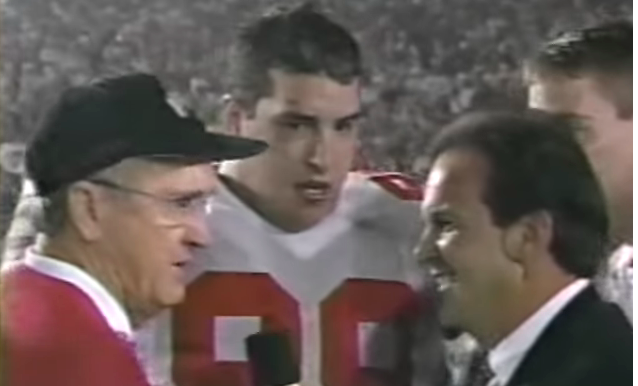 Twenty-two years ago John Cooper finally won a big game for Ohio State. Then he immediately challenged the Florida Gators to a duel in Pasadena. His No.4 Buckeyes had just taken down the No.2 and previously undefeated Arizona State Sun Devils in what was still the pinnacle destination for the Big Ten champion. Top-ranked Florida State would face No.3 Florida (a rematch of the game FSU had won a month earlier) the following night in New Orleans. This was the penultimate season of the Bowl Alliance, which left the Rose Bowl out of the mythical championship mix. It was just an Orange, Fiesta and Sugar party. But the 1996 season did not care, producing a natural Final Four with the Big Ten and PAC Ten champs in Pasadena and the ACC and SEC champs in New Orleans, something the CFP still hasn't produced. The title was still up to the voters. Cooper watching Ohio State's final offensive play. A Seminole win would have left no doubt. A Florida win, well - Coop knew his squad, which only allowed nine points a game (!) that season, would probably finish second in the polls. Both the Gators and Buckeyes had lost close rivalry games at the end of November. Ohio State had a viable claim to No.1 and he knew it. Florida just happened to be ranked one spot higher. So with microphones in his face and - finally - a big game in his pocket after October, Coop was full of piss, vinegar, pride and pent up frustration. He made the challenge on national television while standing on stage following the finest non-Michigan outing of his career. He had never looked or sounded this happy at any point in his red sweater tenure. "Bring'em here two days from now!" He demanded of the Gators. "We'll play'em!" The crowd that stayed for the celebration roared with approval. Coop then announced his team would be taking a victory lap around the field to thank - and this is a direct quote - "the great fans that have been behind us, win or tie." It was the best act like you've been there before example for a beleaguered coach who was actually winning the Granddaddy for the second time in his career. But it fit the program tone of the era. Ohio State had repeatedly tried and failed to be there for too long. Coop's relief was undeniable, and it was amplified and parroted by the players. Check out the consistent message upon winning the Rose Bowl - in a season where the Buckeyes' national title hopes were dashed as 17-point favorites at home in a revenge game to a Michigan team that would go on to lose the Outback Bowl. See? We can win the big game! WSYX coverage in Columbus had Clay Hall on the field breathlessly talking about how this particular win was the program-changer Ohio State desperately needed; a milestone it could use to finally build something special. Ultimately, the 1996 Buckeyes finished second behind the Gators, who destroyed the Seminoles 52-20 in their rematch. Coop's team finished No.8 the prior year, had both the Heisman, Biletnikoff and Lombardi winners (neither of the first two were particularly heralded recruits) along with an 0-2 grand finale. The two seasons before that, Ohio State finished No.9 and No.10. So the 1996 campaign marked the Buckeyes' fourth consecutive top ten finish, its longest streak since the 1970s. Cooper had built an elite program and yet, beating ASU - a one-hit wonder and nothing approaching a blue blood - was unquestionably a generational win. That's how badly and consistently Ohio State was losing big games. Luke Fickell played the entire game with a torn biceps. "I think this is a great breakthrough for this program," said Andy Geiger, shortly after Coop's plea to play Florida on three days' rest. The proclamations came from the futility against Michigan and his track record in the consolation bowl games that followed (when Georgia got run over by four-loss Texas in the We Wanted to Be Elsewhere Bowl, it was deja vu for those of us who survived the 1990s). Had the Buckeyes simply played their 10th worst game of the 1996 season instead of whatever the devil-infused hell that 2nd half against Michigan was, Coop would have a national title. Coop would have had validation. Coop would have had one more precious Michigan data point in his favor, which might have impacted the negative ones that followed. Coop would not have challenged Steve Spurrier to a duel in Southern California. Coop might have had an entirely different coaching epitaph than the one he has. The Rose Bowl was not just a cure, it was a beginning. Ohio State's play of the decade: A blown coverage to win the 1997 Rose Bowl. That breakthrough on Jan 1, 1997 set in motion everything that has followed through present day. Jim Tressel is largely credited, but look at who built his roster - and notice the wave those players rode in on. Coop's successor ended Miami's 34-game winning streak and Ohio State's 34-year title drought on the strength of talent that found its way to Columbus through that program-defining win. Tressel turned the rivalry with Michigan inside-out. Urban Meyer then kept the mantle clean. The 1997 team was good enough to beat the eventual national champions but lost on the field through tragic miscues rather than inside the coach's headset. The 1998 team blasted Michigan out of the stadium, but that final squandered national title year tilted Coop toward his permanent exit over his last two forgettable seasons - if he couldn't win it all with that team, it probably wouldn't happen. His will was broken. His roster was not. And so the program was still stocked, ready and equipped with that big win in Pasadena still playing in syndication even after Tressel arrived. It just needed more of those big wins, beginning with the rivalry. Beating Michigan and winning postseason games became the expectation instead of the dream. Chop up the 28 seasons since Coop finished rebuilding the modern OSU recruiting standard into seven-year segments and the launching pad could not be clearer. The seniors who exhausted their eligibility in Pasadena back in 1997 won 41 total games, a new Ohio State record. To put that in perspective, each of the past seven senior classes has won at least that many. The seniors who just beat Washington won 48 games. The 5th year guys experienced 62 wins. One extra season delivered 21 more wins than the school record set the year most of them were born. Winning big games feels like an entitlement in 2019, the numbers justify that expectation - and it all began that afternoon in Pasadena when winning the big game finally became a reality again. Now, if only they could do something about those double-digit B1G West home underdogs.